What happens when the Mediterranean diet and the DASH diet meet? The MIND diet, a combination worth considering to help you stay mentally sharp as you get older. If the Mediterranean diet and the DASH diet had a baby, it would be the MIND diet. If you want to up the odds of staying mentally sharp as you get older, it’s a way to eat that’s worth considering. The Mediterranean diet has a well-established track record of promoting overall good health while reducing the risk of cardiovascular disease, type 2 diabetes and cancer. The DASH (Dietary Approaches to Stop Hypertension) diet is a similarly healthy eating plan that is effective for lowering high blood pressure. While both of those ways of eating have been shown to have benefits for brain health, reducing the risk of cognitive decline from dementia and Alzheimer’s disease, the MIND (Mediterranean-DASH Intervention for Neurodegenerative Delay) diet is tailored to fit the current science, taking the best of both diets and going a step further. It was developed by Martha Clare Morris, a nutritional epidemiologist at Rush University Medical Center, through a study funded by the National Institute on Aging. The most significant shifts the MIND diet makes are in its recommendations for vegetables, fruit and fish. For the effects of fish on brain health, the biggest difference is between people who eat no fish and those who eat at least one serving per week — especially among those at high risk of Alzheimer’s. Research shows that eating a lot of vegetables — especially green leafy vegetables — is associated with slower cognitive decline, but when it comes to fruit, researchers only saw a difference with a few servings of berries each week. “Higher intake of fruit wasn’t bad, but it wasn’t providing any substantial benefits in terms of memory,” Grodstein said. Blueberries — and strawberries to a lesser extent — differ because they are rich in anthocyanins, a type of phytonutrient that has positive effects on the areas of the brain that affect learning and memory. Moon said that while the Mediterranean and DASH diets appear to reduce the risk of Alzheimer’s disease only if followed strictly, the MIND diet was effective even when followed less closely. “Following most guidelines cut the risk of Alzheimer’s disease in half and kept the brain 7.5 years younger. Following about half of them still reduced the risk by 35 percent,” she said. A randomized clinical trial is underway that will directly test the effects of the MIND diet compared with a standard “control” diet, based on the following 15 guidelines. So what can you do today to make your meals more MIND-worthy? • Double down on dark-green leafy vegetables. Keep greens like kale, arugula, collard greens and spinach washed and ready to go so you can enjoy some daily. • Keep fresh or frozen blueberries on hand. 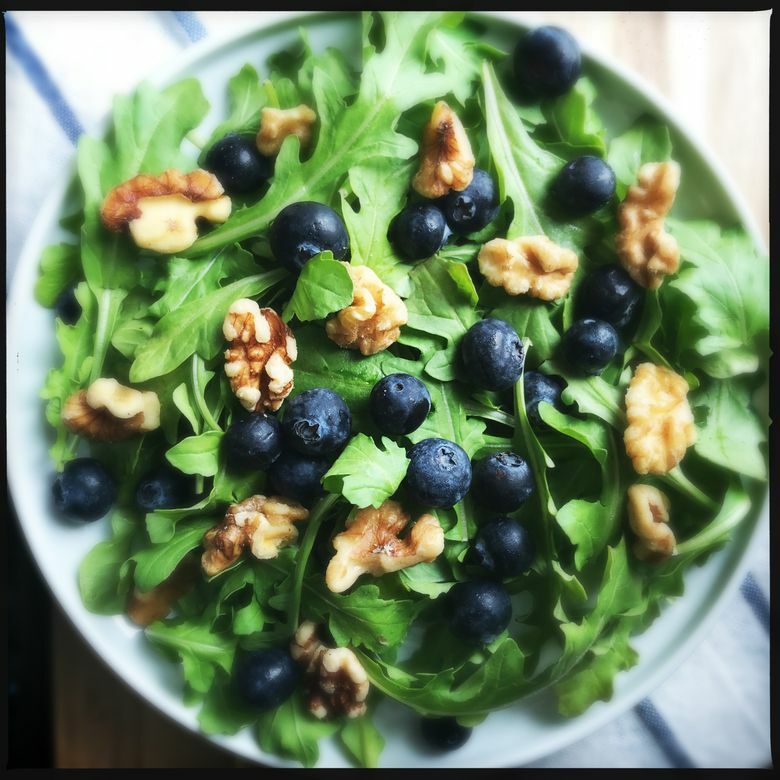 Toss some fresh blueberries and walnuts on an arugula salad for a brain-boosting trifecta. Add them to oatmeal or smoothies. • Plan at least one fin fish meal for this week. Fish with fins — especially salmon, sardines and anchovies — are rich sources of brain-healthy (and heart-healthy) omega-3 fatty acids. If you enjoy shellfish, have it in addition to — not instead of — your one fin fish meal. • Cook a batch of whole grains and a pot of beans (drained, rinsed canned beans are OK, too) and use them in meals throughout the week. • Have a serving of nuts for a snack or sprinkle them on one of those leafy green salads. “I love that you can take the concepts of the MIND diet and apply them to any global cuisine,” Moon said. “Korean bibimbap made with fish, Mexican bean salad, Japanese buckwheat soba noodles with poached chicken.” If you want to know more about the science behind the MIND diet, along with practical tools, check out Moon’s book, which includes 75 recipes, along with seasonal food guides, preparation tips, menu planning work sheets, and scoring sheets. Moon also puts her culinary-school training to good use by posting new recipes on MINDdietmeals.com.